Before Lebron James announces tonight about his decision and rids us of this media circus that has gone a tad overboard, it’s a good time to check how the rest of the free agents did and where will they show up next season. Yao Ming – The Rockets were hoping that keeping Yao Ming will help them land a big name free agent, with their intentions focused on Chris Bosh, but apparently they’ll have to turn elsewhere, with Bosh going to Miami. Still, if Ming is returning healthy, they have one of the best Centers in the league and an Idol to more than a billion Chinese. Rudy Gay – Gay was on his way to Minnesota, but the Grizzlies decided to keep their star small forward and match any offer he gets. So Gay stays, getting 82 million dollars for next five years, not a bad deal, on a Memphis team that wasn’t too far from making the playoffs this year and should be in the chase mix in 2010-2011. 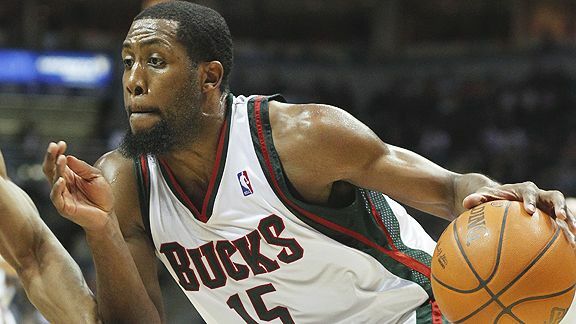 John Salmons – John Salmons has proved in the last couple of years how much he can add to a team by helping both the Bulls and the Bucks make the playoffs, scoring nearly 20 points a night for both teams after arriving via trade. Milwaukee also added Drew Gooden to their promising mix, a rotation that went 18-5 after Salmons’ arrival last season, until Bogut got injured. Salmons signed for five years and will make around 40 million dollars, with Gooden making 32 in five. The Bucks, although not looking like a title contender, will be a dangerous side in the Central division. And who knows how much Jennings will get. Paul Pierce & Ray Allen – The Boston Celtics had a few priorities right after their painful game 7 loss to the Lakers. 1 – Keep Rivers. 2 – Keep Pierce. 3 – Allen. That’s exactly the order of the way they took care of business – A couple of days after Doc Rivers said he’ll return for another year, Boston signed Pierce to what appears to be 61 millions in four years, creating a bit of cap space and keeping Pierce for years to come (already 12 years in Boston). Yesterday it was the final touch, with Ray Allen announcing he’ll return for two more years with a contract worth 20 million dollars, the amount speculated the C’s and Allen would agree on. Now Boston keep their core together, with an improving Rondo, and get some cap space to try and bolster the rotation for maybe a last shot at another title with this squad. Dwyane Wade – One part of the uneven triangle created in the last two weeks, as both him and Bosh announced, together, about their intentions to play together in Miami. There are rumors that someone for the LeBron camp leaked the news about Bosh and Wade so LeBron will have to stage to himself tonight, but that doesn’t matter. Miami have two superstars again, and who knows, maybe after tonight, they’ll have their own little All-Star team, which currently hardly has enough players to dress a starting five. Joe Johnson – Got exactly what he wanted. Despite the boos and the criticism, JJ wanted to stay with Atlanta, but he also wanted big bucks. Atlanta were the only team that could give him 120 mil for six years, while the others offered 95 for five years, but understanding that he isn’t a first option for almost anyone, all craving for the LeBron-Wade-Bosh triangle, Johnson decided to stay where he’s comfortable and paid the most. Now the Hawks need to see how to get one step further in the playoffs. Dirk Nowitzki – I couldn’t see Dirk playing for any other team, it just doesn’t seem right. He has spent the last 12 years with the Mavs and holds the scoring and rebounding record for the franchise, and now he’ll have four more years (with 80 million dollars) to try and get that title. I guess, like in every relationship, he needed some air, a night or two out with the guys, to know he can still land a hot girl if he wanted to, but knows that the wife at home is the best for him. Amar’e Stoudemire – Never felt at home with Phoenix, but now he’ll have to adjust to a Nash-Less life, which could be very very hard, especially with the Knicks not looking anything like a contender. Amar’e will make nearly 100 million dollars for the next five years, and he hopes the Knicks can lure another big name (James’?) or a few decent players so he can help the Knicks be a winning team again. Last time they finished above .500 was the 2000-2001 season under Jeff Van Gundy. 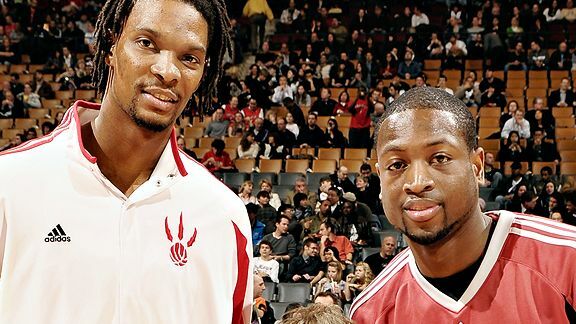 Chris Bosh – He talked making the best decision for himself and his family, and teaming up with Wade and potentially LeBron does look like an excellent move. Even if LeBron doesn’t join them, there’s tremendous potential for a new title contended in Miami with the right moves made in the next couple of years, something that didn’t seem to happen with Toronto. Now the only matter is will Toronto do a sign-and-trade with the Miami Heat, which will have Bosh earn 96 million in five years, or 125 million in six years if he joins them as a free agent. Carlos Boozer – Chicago didn’t get the Wade-Bosh package they were hoping for, so they landed the best interior scorer they could get, and Boozer was the best one out there. He scored 19.5 points with 11.2 rebounds last season for the Jazz, joining a team that has made the playoffs the last two years and hopes it can raise its game and reach the conference semi finals or more for the first time since 2006-2007. Boozer signed for five years and will make around 80 million dollars. Chicago still have around 16-17 million dollars in cap room, and will probably be going for a shooting guard or a wing-man to put the final touch on the team being built there. Who knows – Mike Miller? Kyle Korver? Maybe Richard Jefferson. After LeBron makes his decision tonight, we’ll all be glad it’s over, and a lot wiser about who’s going where.